Sheetal is a public health expert, disability specialist and social entrepreneur. Currently she is working as Chief Executive Officer and Board Member of one of the India’s leading non-profit, Maharogi Sewa Samiti (MSS), Warora, operating from one of the most backward districts of Central India, building livelihood capabilities of most marginalized people, especially those with disabilities like leprosy afflicted, orthopedically handicapped, vision and hearing impaired and primitive tribal populace for last 67 years. With her diverse educational background and experience, she is working to strengthen the most essential pillars of rural system-health, education and sustainable village development. She has been working on creating door-step health museums to poor people and school children for spreading awareness and information about preventable diseases, nutrition, insurance & health rights which may further substantially reduce disease burden in their village. She has also been awarded an award grant for setting up ‘Centre of Excellence for Medical Leadership, ethics and Motivation’ at Anandwan by Lancet Commission on Global Surgery and WHO alliance. She also organizes multiple free health camps in various domains such as reconstructive surgery, cataract removal, skin, psychiatric and retinal diseases, diabetes detection and treatment at Anandwan for benefitting rural poor. She serves on the advisory board of India’s leading public health institutes- Indian Institute of Public Health and Public Health Foundation of India, Delhi. She is also experienced in working with children and youth with disabilities across a wide spectrum ranging from education, physical and medical rehabilitation to building innovative business model for gainful employment. She also works with rural schools to reform their education systems through IT systems, health and nutritional counselling to children. Currently she is also engaged in an ambitious project of making Anandwan a one of its kind ’smart village’ in the country by making it smarter, technologically efficient, economically productive and environmentally sensitive. In January 2016 she was selected by World Economic Forum as ‘Young Global Leader 2016’. This honour is bestowed by the World Economic Forum each year to recognize the distinguished leaders under the age of 40, nominated from around the world. This is in recognition of a person’s record of professional accomplishments and potential to contribute to solving the world’s pressing issues. She is an active part of ‘SABI’- South Asian Bridge Initiative that aims to set up constructive philanthropic models in South Asia. She was chosen as an ‘Innovation Ambassador’ by the United Nations in April 2016 to the 10th Anniversary of the World Summit on Innovation held at the United Nations Headquarters, New York on May 18-19, 2016. Currently she is working as an Adviser to ‘i4P’ (Innovations for Peace), an initiative of World Summit on Innovation and United Nations. She is also the recipient of 2016 INK fellowship. She is a member of various policy level education, agricultural and entrepreneurship development and healthcare innovation committees that include governmental and non-governmental apex committees such as WHO and Lancet Commission on Global Surgery on rural surgical health and leadership, distance education committees of Mumbai University and an empowered committee for mid-day meal set up by Government of India. She is also a professional photographer and helps NGOs document their work through photographs. 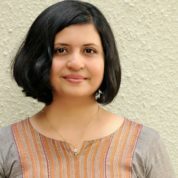 Her professional qualification includes an MBBS degree with a gold medal in surgery, Master’s degree in Social Entrepreneurship from Tata Institute of Social Sciences with silver medal, Certificate in Non-profit Governance and an ongoing diploma in financial management and accountability from Financial Management Service Foundation-TISS alliance. She is married to Gautam Karajgi who is a management expert. He is a Trustee of Maharogi Sewa Samiti and looks after management and smart village project. They have a 3 year old son, Sharvil. "Value education is the only solution for maintaining World Peace. Teachers are the most capable people to engrave values on children’s minds. Preserve Teachers, Preserve World Peace!"